Graphic Design goes through trends, much like any other avenue of society. Fashion, movies, shows, language, music...it all goes through trends regularly. Design is no different. The trend right now is being called "The Flat Trend". No drastic gradients, no chisels, no drop shadows...just clean typography and imagery. You can see it in the redesign of many large corporations' logos. It's been going on for some time, but I wanted to bring it up to see what people prefer. But despite a few companies sticking with gradients or drop shadows, the trend right now is flat. These trends always go in cycles. Don't be surprised if a bunch of notable companies go crazy and go back to gradients and stylized text in a few years in an effort to be "fresh". What type of identity design do you prefer? Do you like the stylized typeface that makes a company instantly recognizable (old Yahoo logo, Coca Cola, Old Microsoft) or do you prefer the new wave of sans serif logotypes that all look the same to the untrained eye? Do you prefer logos that pop off the screen or page with a gradient or a drop shadow? 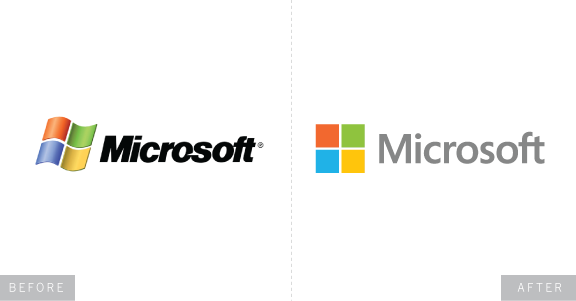 Or do you prefer the new wave of clean, flat logos? Who knows how long the trend will last, but we'll likely see more of it in the years to come.